In this hotly anticipated follow-up to the smash hit IQ, a New York Times Critics' Best of the Year and winner of the Anthony, Macavity, and Shamus Awards, Isaiah uncovers a secret behind the death of his brother, Marcus. For ten years, something has gnawed at Isaiah Quintabe's gut and kept him up nights, boiling with anger and thoughts of revenge. Ten years ago, when Isaiah was just a boy, his brother was killed by an unknown assailant. The search for the killer sent Isaiah plunging into despair and nearly destroyed his life. Even with a flourishing career, a new dog, and near-iconic status as a PI in his hometown, East Long Beach, he has to begin the hunt again-or lose his mind. A case takes him and his volatile, dubious sidekick, Dodson, to Vegas, where Chinese gangsters and a terrifying seven-foot loan shark are stalking a DJ and her screwball boyfriend. If Isaiah doesn't find the two first, they'll be murdered. Awaiting the outcome is the love of IQ's life: fail, and he'll lose her. Isaiah's quest is fraught with treachery, menace, and startling twists, and it will lead him to the mastermind behind his brother's death, Isaiah's own sinister Moriarty. NYTimes: As anyone who read “IQ” will know, Ide isn’t a one-plot type of writer. He sets many schemes in motion. In the new novel, they involve gambling, a natty Rwandan Hutu gangster who lost one leg to the Tutsi, Chinese triads, money-laundering, human trafficking and a whole lot more. Ide writes about the hostility among ethnic groups — notably black gangs and Chinese triads (whose members’ affectation of American gang habits comes in for some mockery, though their toughness does not) — in ways that would be offensive if they weren’t equal-opportunity insults. The world of these books is one of constant trash talk, and Ide delivers it with style. None of it comes from Isaiah. He remains the one stand-up guy in the midst of hot- and cold-running human detritus. But eight years have changed him. He’s no longer the boy wonder we first met. He’s a grown man with no concrete future plans who solves neighborhood crimes mostly as favors — until he suddenly discovers motivation. San Francisco Chronicle: Isaiah isn’t the literary world’s first African American private detective. But, he’s one of the few. His character brings a perspective that is often missing in mystery novels where the good guys navigate the underworld as fleeting visitors. Isaiah knows gang members by name and knows what motivates them because he lives alongside them. They’re real people who grow and evolve. People like Dodson, a former crack dealer who used to be Isaiah’s roommate. Dodson, no dummy himself, occasionally partners with Isaiah in the private investigation business. “Righteous” is a tale of two mysteries told in a series of flashbacks. The common thread between them is Marcus. The book jumps between Isaiah solving the murder of his brother, and Isaiah and Dodson partnering on a new case to help Marcus’ beautiful girlfriend. Both cases resurrect memories Isaiah had tried, unsuccessfully, to bury. In “Righteous,” Isaiah faces the harsh reality that sometimes he’s not the smartest guy in the room. Dodson has an annoying habit of asserting himself in the case, trying to keep up with Isaiah’s big brain. And Isaiah faces an opponent who is just as cunning as him — and pursuing the same thing Isaiah wants. 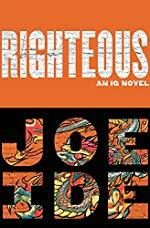 “Righteous” is a book about a genius who realizes he doesn’t know everything. The worthy sequel to “IQ” ends with the promise that more cases and lessons are in store for Ide’s intriguing hero. I enjoyed this one even more then the 1st book - probably because it's not centered around the music industry (which felt a touch cliche in IQ) and it's a bit grittier. I enjoyed this one more than the first and especially liked Dodson growing into more than just a silly foil to IQ. Came in to say exactly what MoonOrb said. I'm impressed at how much Ide is willing to upend his series right from the start. I did have some issues with the split timeline, but once I figured out which was which, it didn't rankle me any. For me, the problem was the physical logistics of the shooting in the alley. I just couldn’t envision it. But I was so glad that IQ was not a one-hit wonder, or too gimmicky the second time around. Everybody matured, I felt. Can’t wait for book 3 out in the fall!